This is a preview of TechMogul Industries applications for Blackberry. The first application I am introducing today is CaptureIt. CaptureIt is a simple utility that allows people to capture a screen shots straight from their Blackberry devices. The image will either be saved to a memory card, or if none is available it will be saved to the device memory. CaptureIt is available today as a free download for all Blackberry users. Simply assign CaptureIt to one of the Blackberry convince keys and press to capture. Stay turned for other exciting releases from TechMogul Industries. If application errors, make sure permissions are set to allow. Visit the Techmogul.com soon for more releases. Works on devices 4.3 and higher. To use: Assign CaptureIt to one of the convince keys. Then from any screen, press the convince key and the capture will be saved. If there is a memory card, it will be saved to that. If there is no memory card it will be saved to the device memory. Last edited by Cool6324; 11-14-2008 at 02:18 PM. Check out CaptureIt for Blackberry. A free screenshot program. Works on all Blackberry's 4.3 and higher. Captures can now be taken via the Blackberry menu. I would also like to give a huge thanks to our co-Developer In Chief Landon Rodgers, for his contributions. His outlook and development skills are greatly appreciated on our team. Visit www.thetechmogul.com for future releases! Is this for any device 4.3 and higher? (Bold, Curve, Pearl, 8700, Javelin, and Storm). With the new version (1.2) you don't have to assign a button to the application. 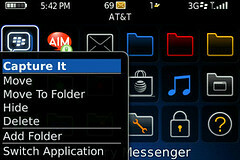 On any screen just press the menu (blackberry) button, and then press CaptureIt. 8830 - Verizon - 4.5 OS and I downloaded the app via OTA. Well, I tried to use this, and it just won't work. BB button, scroll to Capture It, click, and nothing happens. No vibrate, nothing. I tried it several times, and then checked my media card, and there is nothing saved to it. Checked device memory, nothing saved to it. OK, upon further searching, I have found that you must edit the permissions for this program to work. So nice... what theme is it ?